Thanks to Dr. Eddie Fridman, The Chaim Sheba Medical Center, Israel, for contributing this case. To contribute a Case of the Week, follow the guidelines on our Case of the Week page. (1) We are looking for more cases of the week (we are down to a two month supply). We are also looking for a reviewer(s) for the Salivary Gland chapter. If interested, please email NatPernick@hotmail.com. (2) We are looking for pathologists with expertise in the topic to write a 250 word article on "What's New" for these future Feature Pages: Consumable Lab Products (Nov11), Grossing workstations / lab furniture (Dec11), Billing / consulting / management (Jan12), Microscopes / slide imaging (Feb12), for $50 per article. If interested, email Dr. Pernick at natpernick@hotmail.com. (3) The ASCP published their Fellowship and Job Market survey, click here. A 37 year old woman had a right renal mass, and underwent a partial nephrectomy. Angiomyolipoma (AML) is a neoplasm composed of blood vessels, smooth muscle and adipose tissue in varying proportions. It derives from the perivascular epithelioid cells, first described in 1991 (Am J Surg Pathol 1991;15:644), but with no known normal cellular counterpart (Arch Pathol Lab Med 2009;133:648). No precursor lesion for PEComas has been described. PEC related tumors include angiomyolipoma, clear cell sugar tumor, lymphangioleiomyomatosis, and other rare tumors labeled PEC-NOS. 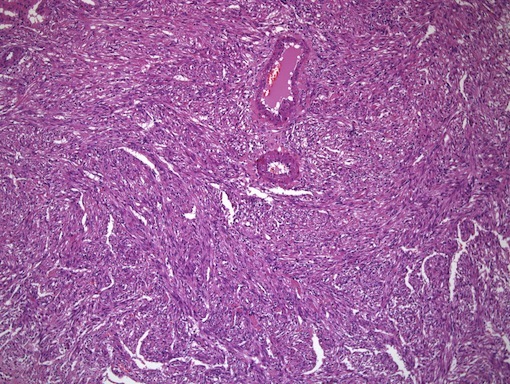 These tumors are often perivascular, and have varied histology. 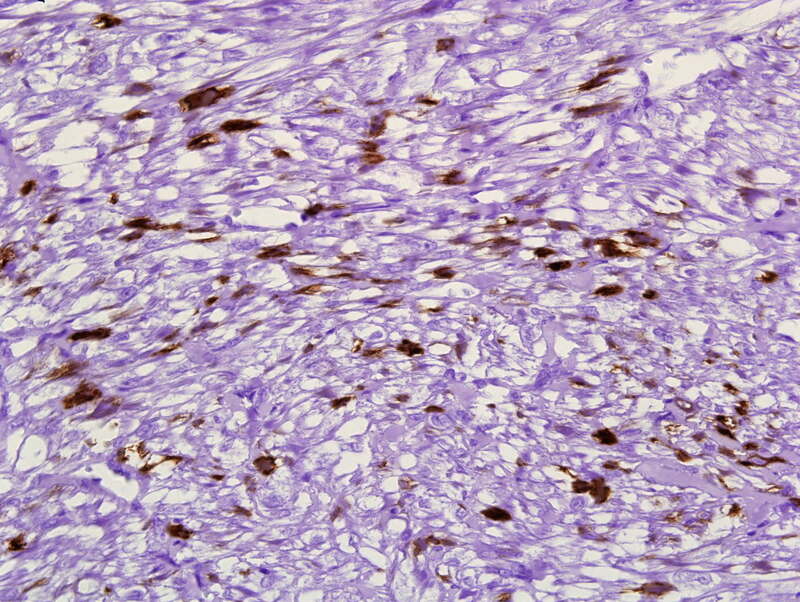 The tumor cells have clear to granular, lightly eosinophilic cytoplasm, with small, central nuclei and indistinct nucleoli. There is typically no/mild atypia and no/rare mitotic activity, although exceptions occur. 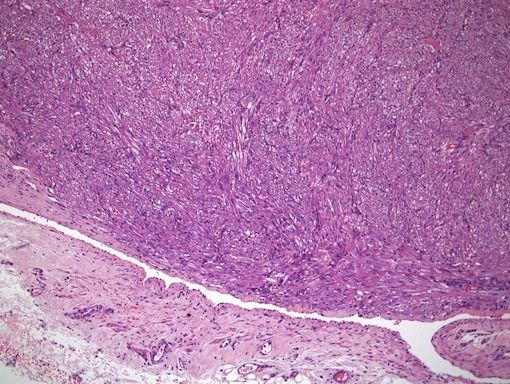 In angiomyolipoma, adipose tissue typically predominates, although cases with mostly smooth muscle, as with this patient, do occur, often in the renal capsule ("capsuloma"). 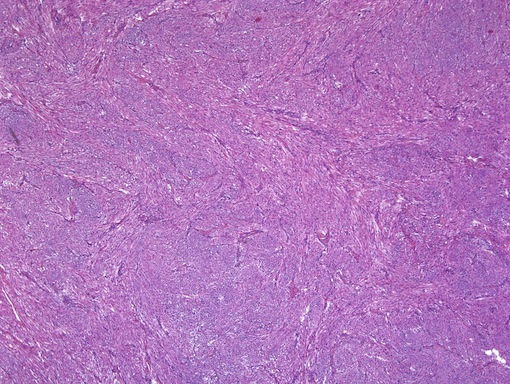 Smooth muscle cells are intimately associated with the vessel walls, and may appear to "spin off" the walls in a radial fashion. The blood vessels are thick walled and tortuous, resembling arteriovenous malformations. 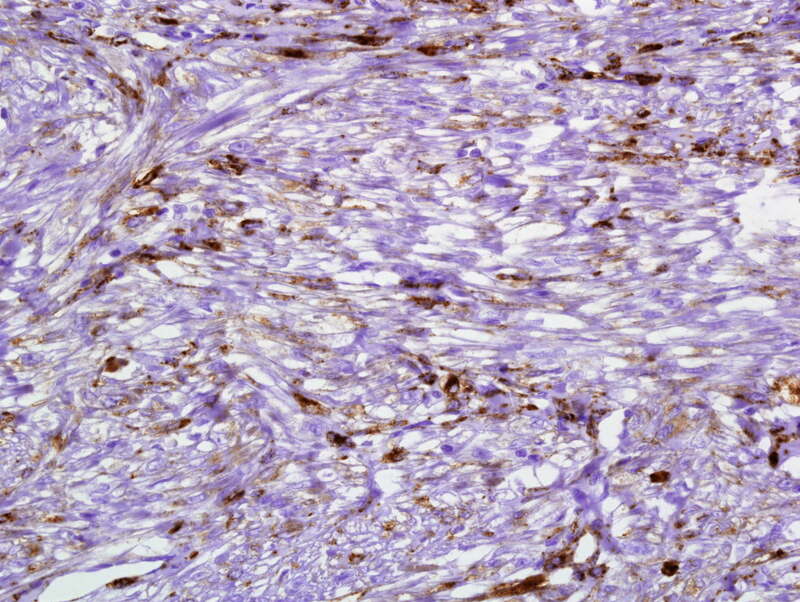 PEComas have a distinctive immunohistochemistry profile, with reactivity for myoid (desmin, smooth muscle actin, calponin) and melanocytic (HMB45, MelanA) markers. Keratins are typically negative, as in this case. Angiomyolipomas are circumscibed, but not encapsulated. They often become quite large, and can cause life threatening hemorrhage. Although 80% of patients with tuberous sclerosis have angiomyolipomas, most patients with angiomyolipoma do not have tuberous sclerosis (OMIM #191100). 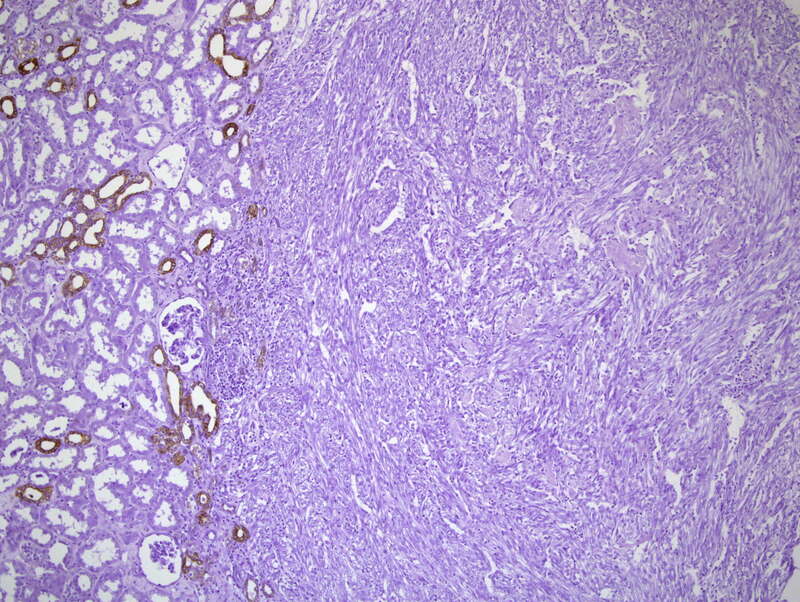 The differential diagnosis of smooth muscle predominant angiomyolipoma includes leiomyoma and leiomyosarcoma. 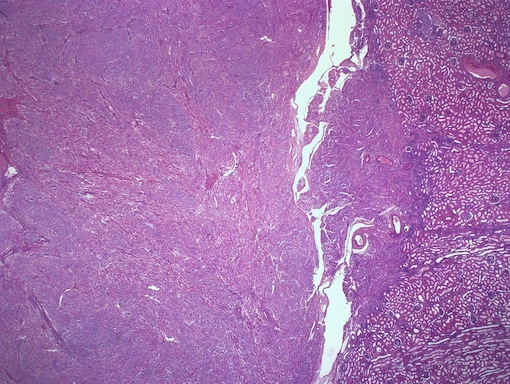 Leiomyoma lacks the characteristic blood vessels and adipose tissue of AML. 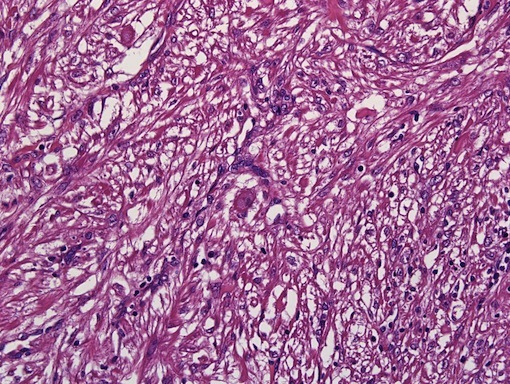 Leiomyosarcoma typically has prominent nuclear atypia, tumor cell necrosis and mitotic figures. 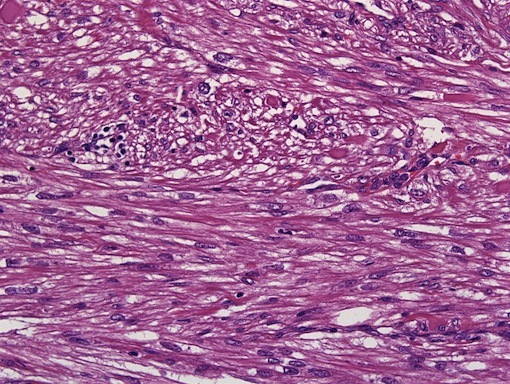 AML typically has benign behavior, although epithelioid tumors are considered to be malignant with the ability to recur and metastasize. Treatment consists of selective arterial embolization (Eur Urol 2009;55:1155) or excision.